From what I can see we are still firmly in a bull market in shares. Momentum remains a strategy that is paying off handsomely with a select group of companies continuing to see their share prices increase faster than their profits. But this will not go on forever. Shares with stretched valuations have little downside protection if the high levels of expected profits baked into the share price fail to materialise. When this happens the pain inflicted by large share price falls can be severe. That said, it can be difficult to sit by and watch people making lots of money. Successful investing tends to be a marathon rather than a sprint. Slow and steady often wins the race over the long haul. One of the most interesting things about investing is that there are lots of different strategies to suit different objectives. Some people prefer to invest in fast growing companies whilst others like to seek out undervalued businesses. However, for many of us there will come a time when we will have to look at the value of our ISAs and SIPPs and think about turning them into an income stream to live on. There will also come a time when it might be a good idea to think about protecting the value of your existing savings as you might not have enough time to recover from a fall in its value before you need the income it can give you. The good news is that there is a strategy which can take some – but not all – of the risk out of your investing and give you a fighting chance of getting a half decent income from your investment compared with handing your money over to an insurance company and buying an annuity – an income for life. 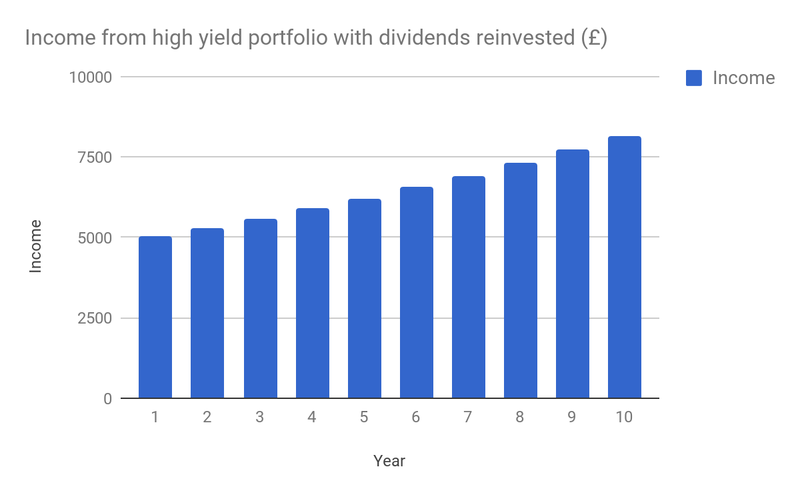 A portfolio of high dividend yielding shares. Reinvesting the dividend income to buy more shares – many brokers will do this for nominal commission (c£1.50). Leveraging the power of time and compound interest. Low interest rates have made it much harder for people to get a decent income from their savings. The amount of income you can get from a £100,000 savings pot has plummeted in recent years. Back in 1990, an annuity made a lot of sense for a 65 year old man as £100,000 would buy over £15,000 of annual income for life. He’d get his money back in just over six and a half years. Today, it’s just over £5,400 according to a number of annuity best buy tables. That figure is down over £400 from two years ago when I last wrote about this subject. These incomes are fixed for life. There is no protection against inflation and no option to leave your pension pot to your relatives after you die. Given this backdrop it is not surprising that many people have decided to take their pension savings into their own hands and have a go at getting a bigger bang for their buck. But just how easy is it to do this? My view is that it is possible to do better but I wouldn’t say it was easy or without risk. 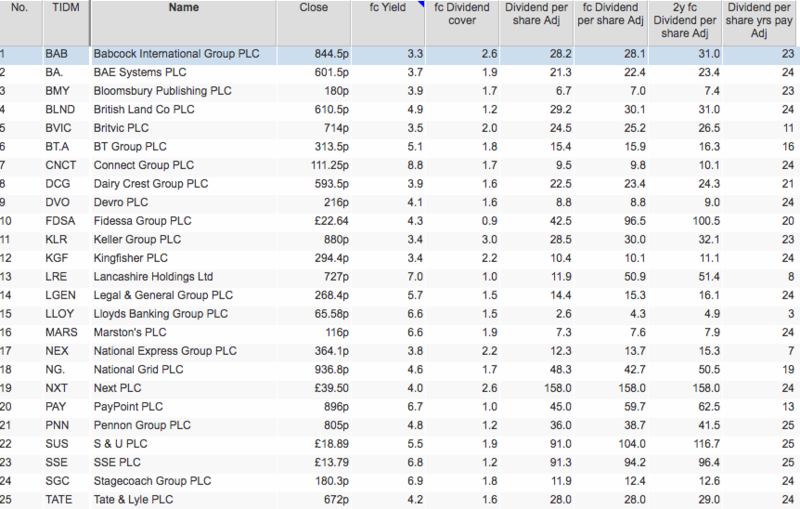 Above is a list of 25 dividend paying shares. Some of them have very high forecast yields with the average yield being 5%. Most of them are expected to maintain or increase their dividend payouts and have paid a dividend of some kind for a long period of time. The exceptions here are Lloyds Banking Group and National Express which have returned to paying dividends after recovering from periods of difficulties. This list is not a recommended portfolio. High yields are often a sign of a questionable dividend or one that is not expected to grow much. I could make a bear case for many of shares above if I wanted to and could have done so many years ago as well. That said, I do think that many of the above have potentially quite resilient income and dividend streams. This is something that you should research before buying any high yielding share. What I wanted to show you is what happens to a portfolio like this if dividends and share prices don’t change at all. All that the investor does is reinvest the dividends to buy more shares every year. Over ten years, the portfolio income on a £100,000 portfolio increases from just over £5,000 to £8,156. This is the power of compound interest and time at work. Even with very modest returns on a portfolio it is possible to compound the value of your savings with remarkable results. The longer you leave this process to work the better the outcome can be. Warren Buffett has been very upfront that the effect of compound interest over more than 60 years of investing has played no small part in him becoming one of the world’s richest men. This is how I explain investing to my children and friends. Yet many people choose to ignore this powerful force in favour of trying to get rich quickly. 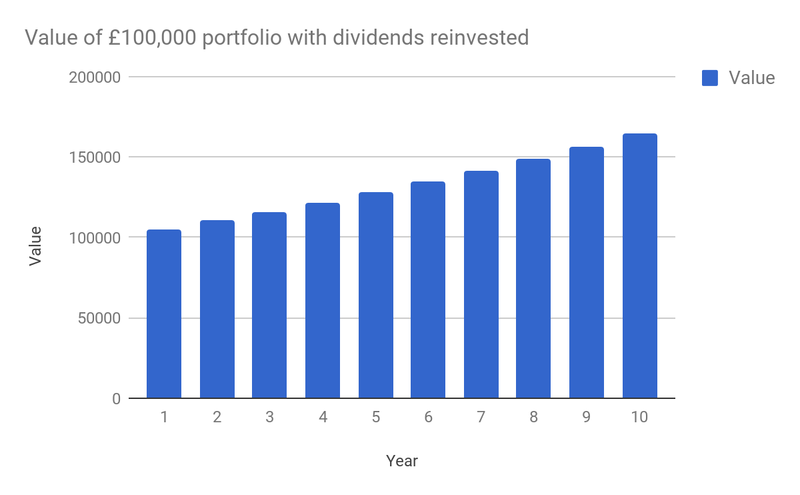 With the current stock market populated with many expensive shares, I think this kind of approach to investing should resonate with some investors who are within ten years or so of retirement and with an eye on their future income requirements. With some research, I think it is possible to find shares that can take some risk away from their savings pots and put them in a good place to getting a decent income stream without handing over their money to an insurance company. Saving via a self invested personal pension (SIPP) is subject to mixed views at the moment. This is mainly due to the fact that the government keep messing around with contribution limits and the lifetime allowance limits (currently £1m) before a pension pot starts being taxed. I can understand why people might prefer the ISA route with annual savings limits of £20,000 per year. That said, higher income pension savers are getting 40% tax relief contributing to pensions. For people who are fortunate enough to have built up a decent sized pension fund – perhaps by following a similar strategy to the one described above – then the current rules on income drawdown from a SIPP mean that quite large annual incomes are paying low effective tax rates. For example, someone with a £500,000 pot today following the dividend reinvestment strategy might have £823,000 in ten years time. That might provide £40,780 of income. If you choose not to take a 25% tax free lump sum then 25% of that income is tax free. The remainder is then subject to normal income tax allowances. The effective rate of tax paid would be less than 10%. Spread your dividend paying shares across different sectors of the stock market in order to reduce your risk. Thoroughly research the business that pays the dividend to make sure the dividend is safe. Check if the dividend was cut during the last recession and see if the business has changed to lower that risk. Pay close attention to dividend cover ratios and whether there is enough free cash flow to pay dividends. Be wary of big debts and pension fund deficits that could lead to a dividend cut. Sell a share immediately if a dividend is cut and replace it with a new one.